"Women and gay people are the litmus test of whether a society is democratic and respecting human rights. We are the canaries in the mine." 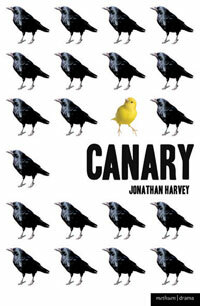 Last night Darren, Stu and I went to see Jonathan Harvey's Canary at the Hampstead Theatre in glitzy Swiss Cottage. It was a moving, funny, uplifting and often magical story about gay love, honesty, dishonesty and being brave enough to sing out at the top of your voice. The play spans almost 50 years, taking in the miners' strike, Aids and the legacy of suppressed secrets and lies in a family over two generations. Along the way we come across a primetime TV host, Queen Isabella, Eleanor Rigby, an 'aversion therary' doctor, Mary Whitehouse and those afore mentioned striking miners. Still in previews the play is at times a little uneven - the first half perhaps being a tad over long - but the second picks up the pace wonderfully. Highlight: the gay 'zap' of the Festival Of Light meeting. Not quite Beautiful Thing but worth a night out.